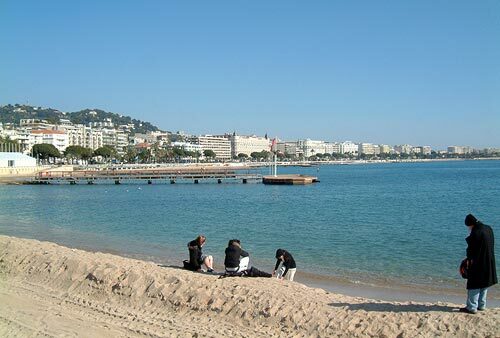 Cannes, located in the south of France, there is a blue Mediterranean sea calmly spread in front of you and majestically rising mountains behind you. It has a warm climate throughout the year and is a popular city for tourists. 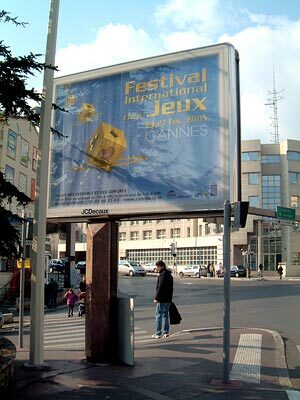 The Cannes International Film Festival, held every May, is also made this city famous and is gorgeously featured on TV and in the newspapers and magazines. The customary event, for the citizens and by the citizens, the Game Festival, was held this year, too, for the 19th time. At this event, which is held for 5 days, organized by the city of Cannes, the numbers of participating groups and visitors have been increasing every year and the number is over a few hundred thousand people. 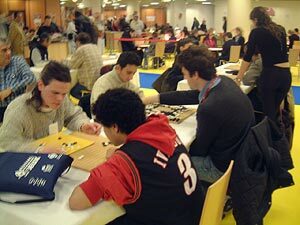 Groups of various games filled up the hall and it was lively with introducing and demonstrating each game and tournament and so on. From Milan to Cannes, it takes about 5 hours by car. I persuaded my husband, a stay-at-home type, and 2 of us went to Cannes to help. To tell you the truth, I felt like refreshing myself at a warm place getting away from the snowy view of Milan but my husband who understands French is useful at this occasion. Well, when I walked through a row of tall palm trees and by the shiny seaside for a while, what I saw was the Festival Hall of Cannes city where the Festival took place. It was such a wonderful day that there were some people swimming at the end of February. 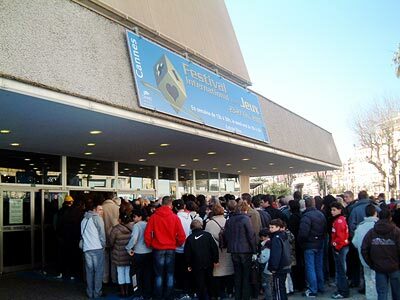 By the way, the Film Festival is also held in the same hall. I felt lucky to walk into the same hall as movie stars. Ha ha ha. During the week, not only ordinary people but also local junior and high school students visited as a social study and at the weekend, it was crowded with families. Because it was free admission, not only people from France but also from Italy gathered for the holiday. At the hall, you can enjoy games from familiar games in Japan, Chess, Bridge and Othello and so on, to traditional games from all over the world, including Awale (Africa), Carrom (India), and Mahjong (China) and so on. 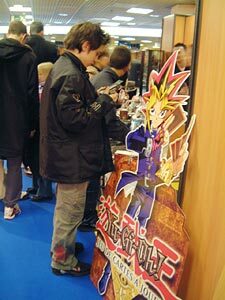 Card games, `Pocket Monster' and `Yugioh' and so on were crowded with mainly boys, and video games and animation corners were crowded with children and young people. The contents of the games vary from international level games to newly invented games every year. You won't get board visiting there everyday. On the weekend, the citizen's marathon was held and a popular TV game show was broadcast and through games as a common keyword, I felt the impression of `have fun with everyone'. At the Go corner, a lot of people, a few hundred people a day, dropped by! 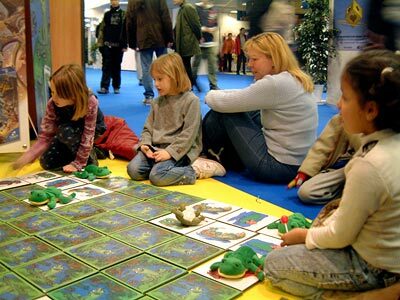 Everyday, people from local Cannes Go Clubs were busy taking the lead in taking care the beginner's class and the visitors. Also, by the arrangement of the Game Festival Committee, the timetable for each school to go through and experience those game sections smoothly was made, so even the number of those school children alone was great. In that way, every student was able to experience the games and enjoy themselves. Surely, it was the best opportunity to introduce Go. After the event at night, I visited the local Cannes Go Club. 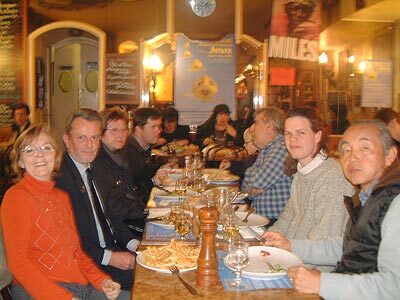 The club was held at a restaurant, Petit Carlton, a minute walk from Cannes station. The members of the club know each other so they are like a family. It was very comfortable except from a smell of tobacco. I heard that the 20th Game Festival, next year, will increase the scale and the number of participating groups. 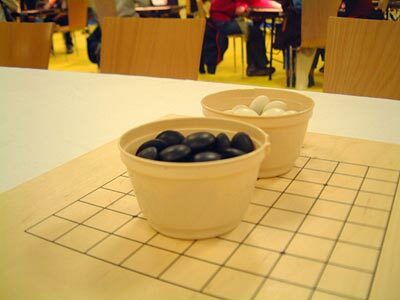 Next time, I am expecting that the event will be more and more substantial with support of the French Go Association and the local Go clubs. This "GO Friends Report " started in February !